State Public Safety Secretary Juan Salinas Altes said nine bodies were found on a major boulevard in the state capital, Chilpancingo, just a few hundred yards from where the state governor participated in a traditional religious procession later in the day amid heavy security. Four main cartels are fighting for position in the U.S. drug trade, with an estimated $14 billion at stake, reports CBS News correspondent Bill Whitaker. Click here for Bill Whitaker's full report. Experts are still trying to identify the bodies found Sunday, but a still-undetermined number of them are soldiers, Salinas Altes said. An army base is located nearby. The bodies were found spread along the length of the boulevard, and nearby a sign was found that read "for every one of mine that you kill, I will kill 10." Nine heads, some gagged with tape, were found in a bag nearby. Local prosecutors said three more decapitated bodies were found Sunday in a village on the outskirts of Chilpancingo. Two other severed heads were found on the same boulevard in Chilpancingo on Dec. 7 alongside a sign reading: "Soldiers who are supposedly fighting crime, and they turn out to be kidnappers. This is going to happen to you." Scores of police and soldiers have been killed since President Felipe Calderon launched an offensive against the cartels in late 2006. While Mexican criminal gangs once appeared to avoid confrontations with the army, they now often openly attack soldiers. 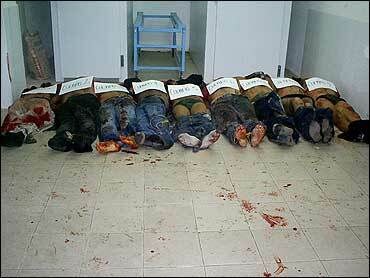 In May 2007, gunmen linked to a drug gang killed five soldiers in an ambush in the neighboring state of Michoacan. Also Sunday, federal police reported they had captured three suspected cartel hit men in the border city of Tijuana, across from San Diego, California. The suspects allegedly had six assault rifles and about 3,500 rounds of ammunition at the home where they were caught.